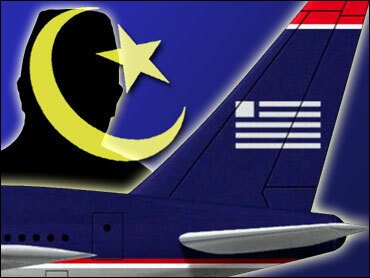 Six Muslim imams were removed from a US Airways flight at Minneapolis-St. Paul International Airport and questioned by police for several hours before being released, a leader of the group said. Hooper said the meeting drew about 150 imams from all over the country, and that those attending included U.S. Rep.-elect Keith Ellison, a Democrat of Minneapolis, who just became the first Muslim elected to Congress. Shahin said they went as far as notifying police and the FBI about their meeting in advance. Shahin expressed frustration that - despite extensive efforts by him and other Muslim leaders since even before the Sept. 11, 2001, terrorist attacks - so many Americans know so little about Islam. "If up to now they don't know about prayers, this is a real problem," he said. Reached by cell phone just after his release, Shahin said he did not know where they would spend the night or how they would try to get back to Phoenix on Tuesday. Hooper said US Airways refused to put the men on another flight. Hogan said more information would likely be released Tuesday. The other passengers on the flight, which was carrying 141 passengers and five crew members, were re-screened for boarding, Rader said. The plane took off about three hours after the men were removed from the flight.